The question "Do Tag Heuer watches hold their value?" is not easy to answer. There is no single answer and there are many influencing factors. Tag Heuer watches are a luxury watch brand. The Tag Heuer company has been making watches since 1860. The watches are much prized by discerning watch lovers the world over and are affectionately known as 'Tags'. "Do Tag Heuer watches hold their value?" is a question that is often asked by people who are considering buying or selling a Tag watch. The answer depends on many considerations. Answer: Do Tag Heuer Watches Hold Their Value? Luxury watches are inclined to hold a relatively good value over the years. This is because good quality and often valuable materials have been used in the manufacture of the watch. A watch that is made from gold or other precious materials will have an inherent value over and above the actual value of the watch. Another reason why they hold a reasonable value is because they are reliable and continue to maintain good time. This means that they can be sold as functioning timepieces when other watches simply fail to perform. Another important factor to consider is the desirability of a watch. Some watches become collectors' pieces and the value of these watches can become inflated over time. In order to maximize the long-term value of a watch, it is important to buy wisely. Limited edition watches often represent good investment; however, they can also command a higher price. Weighing up these two factors is an important part of deciding what type of Tag Heuer watch to buy as an investment. When buying a new Tag Heuer watch it is vitally important to make sure that you are buying a genuine watch. 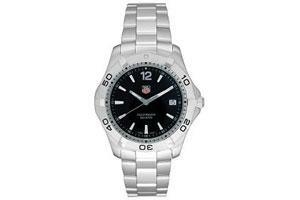 Highly prized watches, such as Tag Heuer watches, are often targeted by counterfeit watch producers. A counterfeit watch will never hold its value and people should make sure that they only buy from authorized dealers. There are many reasons why someone needs to find the value of a Tag Heuer watch. This includes people who have been given or have inherited an old Tag watch that they are looking to resell or people who have invested in an expensive Tag watch and need to realize money from their investment. The most reliable way to find out the value of a watch is to consult a specialist watch valuer. These are people who are trained in the valuation of watches and can also give advice as to any repairs or maintenance that is required to keep the watch in good condition, thus protecting the investment. "Do Tag Heuer watches hold their value?" is a question also often asked by people who are considering selling a watch. In this case finding the best way to sell the watch is necessary to achieve a good price. There are two options. The first is to sell the watch direct and the second is to sell to a dealer. There are strengths and weaknesses to both options. When selling a watch it is useful to provide as much information as possible. This includes the original receipt, if available, and any details of servicing, repairs or maintenance. Luxury watches such as Tag Heuer can be a good investment. Buying wisely and looking after the watch will help to achieve maximum resale value.